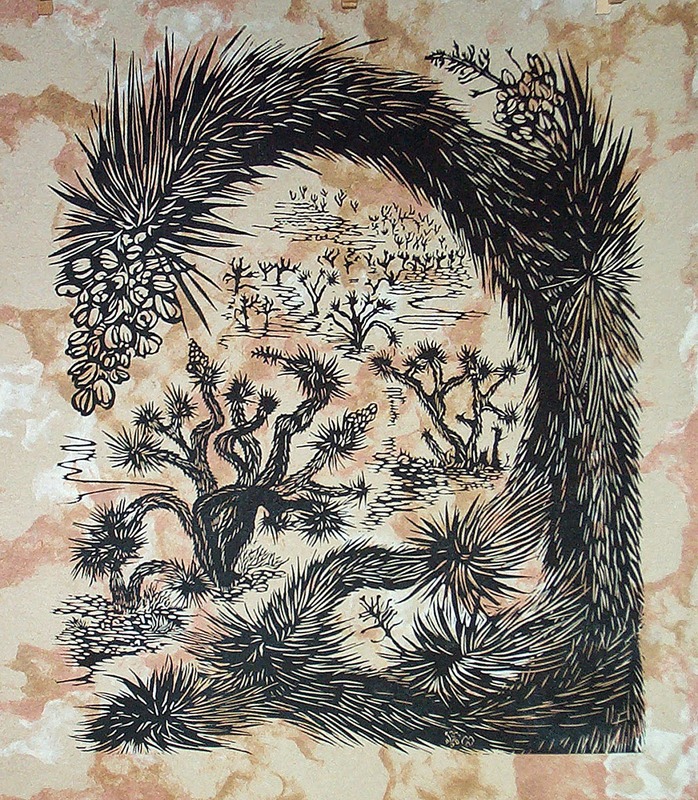 1000 Woodcuts: Artist Residency in THE most beautiful place around these parts! Artist Residency in THE most beautiful place around these parts! While all the excitement from the first puzzle prints exhibit was going on, I neglected to announce my upcoming artist residency. 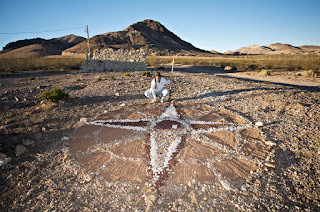 I am privileged and excited to have been chosen for the very first artist in-residence program offered by the Red Rock Canyon Interpretive Association in beautiful Red Rock Canyon National Conservation Area very near Las Vegas, Nevada. Just West of the city, this wondrous place has world-renowned rock climbing and geology, box canyons, water springs year around and more hiking and awe than can be absorbed in a short two weeks. I will be frolicking about, making sketches, writing and leaving my wood-chips in various parts of the canyon. I will also offer two public and free workshops during my residency in which participants will help me make yet another puzzle print! My residency begins April 6th and ends April 19th. Call 702-515-5367 to reserve a spot, limit is 15 students each day. We will be making a collaborative puzzle print with each student carving a tiny piece of a big image. Should be tons of fun! The exact schedule of my wanderings will be available at the Visitor's Center so anyone can come up and find me on any given day. 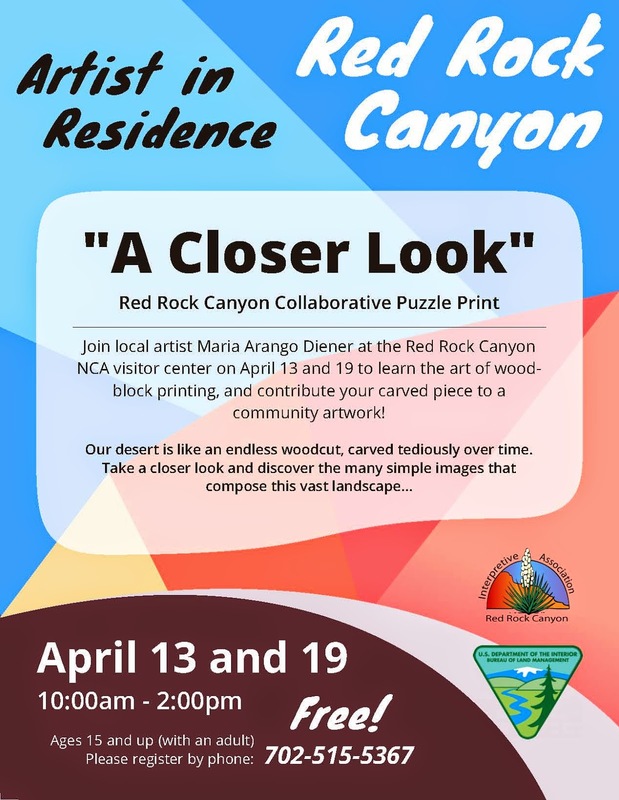 We can chat all about nature, the Red Rock areas, woodcuts and art! Grab a map at the Visitor's Center and check the Artist-In-Residency display for days and locations. My M.O. when art-venturing in nature is to walk, drink the beauty, write a little, sketch a little and photograph a little. I will be faithfully recording the daily frolics in this blog, and on Facebook and/or Twitter as much as I can. The plan is to make a bunch of "sketch" smaller woodcuts and write about the experience, later to be assembled in a publication of some sort.